HYT proposes an artistic and symbolic interpretation of the relentless nature of time with silicon marquetry and its hallmark fluid hours. 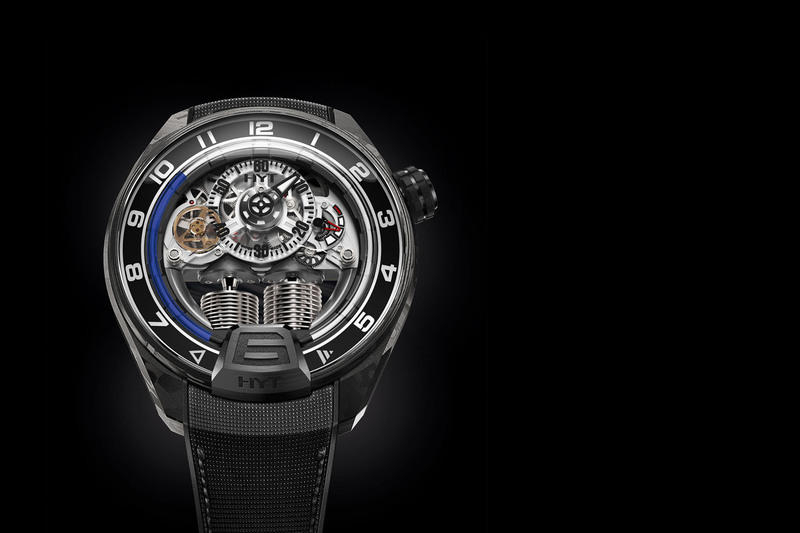 The HYT H0 Time is Precious watch encapsulates a powerful philosophical message. 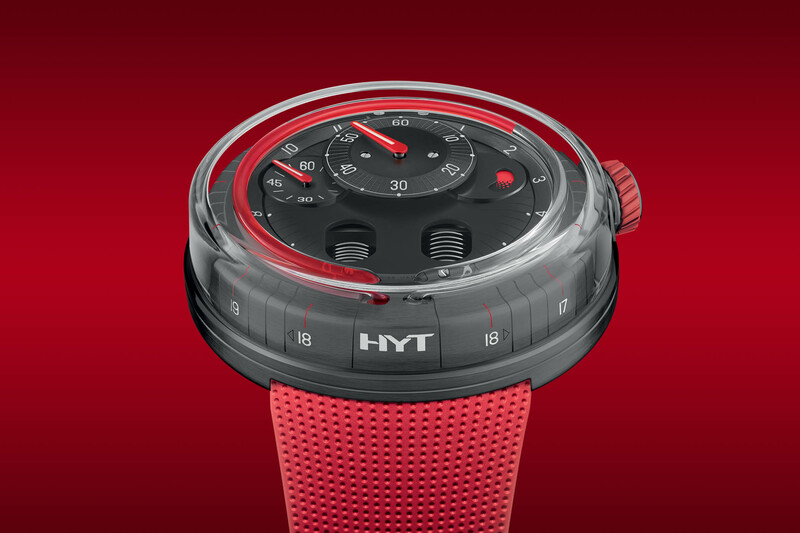 Similar mechanically and structurally to other members of the H0 family, the “Time is Precious” model is unlike anything we have seen before at HYT and ventures down a more artistic path to represent the fundamental philosophical musings that inspired the brand to portray time in a liquid fashion. The dial, made from shards of reflective silicon along with the brand’s hallmark fluid representation of the hours, is intended to remind us that time is unstoppable and invites us to enjoy every second of the day. The very concept of time is an open invitation to philosophical musings. For those of a scientific/mathematical bent, time is independent of the perceiver and progresses at a consistent pace for everybody, everywhere in the universe. Relativistic time opens a whole new can of worms with concepts like time dilation for objects hijacked by gravitational fields and even the prospect of time travel. However, whichever way you choose to look at it, in whichever direction it might be moving, it can’t be stopped. Unlike many mainstream brands whose watches are contextualised with lifestyle proposals – refined, sporty, adventurous, hipster, etc. 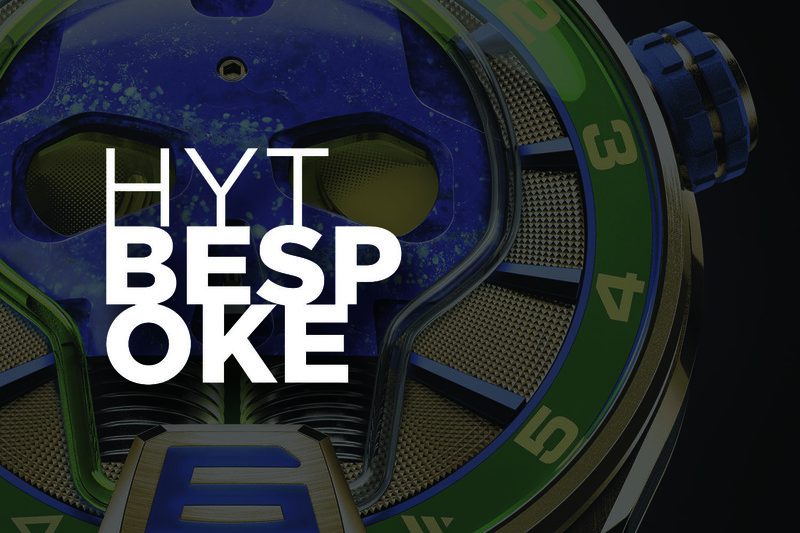 – HYT has concentrated its energy into finding a symbolic way to represent time. CEO Grégory Dourde talked to MONOCHROME extensively about the brand’s unique approach to representing time in the video below, and reveals how the musings of the Greek philosopher Heraclitus proved fundamental in developing HYT’s ‘time is fluid’ concept. Packing such lofty thoughts into a watch is a tall order, so we decided to ask the folk at HYT how they condensed all these lofty philosophical concepts into a watch. In the dedicated MONOCHROME video, designer François Nuñez explains how fluid has played “a very important role in the way we display time, but also in the way we design our watches”. The shape of the H0 is fluid, “like a smooth pebble polished by the water” and the use of glass is “linked to water by its transparency”. In fact, the cambered sapphire crystal makes up for three-quarters of the volume of the watch and the high domed shape offers views of the movement and dial from many different positions. With its 48.8mm diameter and 18.7mm height, you would expect this watch to be challenging on the wrist. Surprisingly, the absence of lugs makes it comfortable to wear and the amount of glass gives it a floating, ethereal presence – although there is no escaping the fact that it will get looked at! The stainless steel case features brushed, micro-blasted and satin finishes and drums home the message Time is Precious, engraved twice in mirror writing around the stainless steel case band. Things get interesting though on the domed sapphire crystal protecting the dial with its engraved grey numerals which can be seen from different positions, frontally and also from the side. The crown at 2:30 is coated with black DLC, the caseback is also made from sapphire crystal and the watch is water-resistant to 30m. HYT ventures into a more artistic realm and turns its hand to the art of marquetry to create an abstract, almost Cubist dial that looks as though it has been made from splintered glass. Instead of using more traditional marquetry materials like wood or nacre, HYT chose silicon to decorate the dial, which was laser-cut into 63 smaller pieces. The arrangement of the shards of silicon is dynamic and the mirror finish on their surface reflects the surroundings and plays with the light in such a way that the watch is constantly changing, being transformed before our very eyes – another reminder of the relentless flow of time. The abstract arrangement of the silicon creates a dynamic pattern and there are four sharp geometric apertures on the dial revealing the bellows, a triangular power reserve indicator that transits from black (empty) to red (full), and a cut-out at 9 o’clock for the running seconds. Styled like a regulator clock, the hours on the periphery are indicated by the red fluid that travels through the capillary and which is pumped back again at the end of its voyage (18:00) with a cool retrograde action. To allow the dial centre stage, the minutes are located on a sapphire counter in the top half of the dial and the minutes hand has a streak of luminescence to consult the time in the dark. Most of you will be familiar with HYT’s innovative system of bellows and capillaries to pump the fluid around the dial, but if you want an in-depth explanation on the technology that HYT had to develop to make sure the liquids inside the tubes didn’t get mixed, and that the time indicated by the mechanical movement was accurately reflected by the liquid, don’t miss our video. You can get a good view of the manual-winding calibre on the caseback with the bellows occupying the lower half and the balance wheel, gear train and barrel firmly held in place by the openworked bridges, which in turn are bevelled and decorated with Geneva stripes. Beating at 28,800vph/4Hz, the movement provides a 65-hour power reserve. The H0 Time is Precious is a limited edition of 50 watches and in keeping with its transparent body, comes on a see-through rubber strap with a titanium folding buckle. 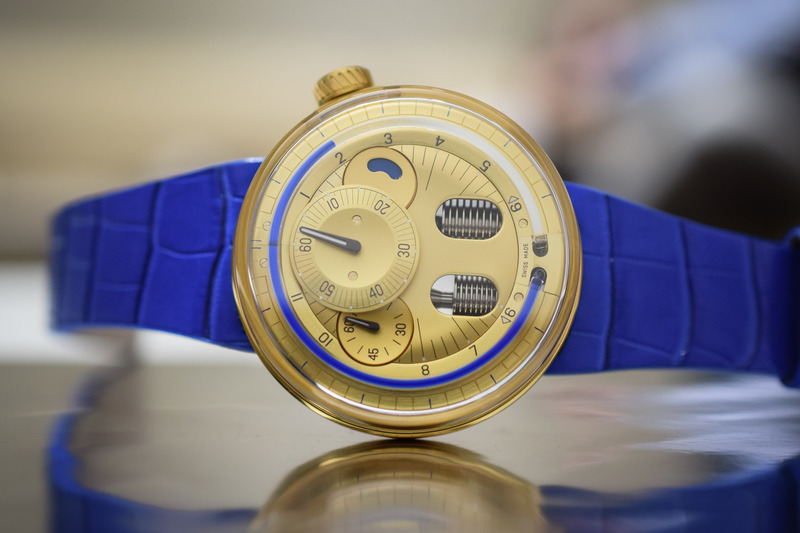 The retail price of the watch is expected to be around CHF 50,000. 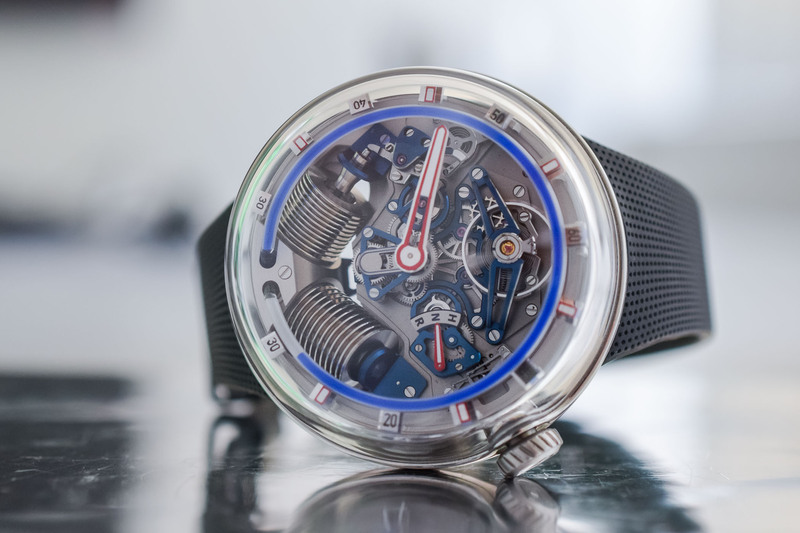 For more information, please visit www.hytwatches.com. For those of a mathematical/scientific bent, there may in fact be no such thing as time, as it is utterly dependent on the perceiver – away from that perception it is just energy being used up; movement/action eaten away by entropy per the rules of thermodynamics. For those of a horological bent, time may be imaginatively characterized by the clever workings of a watch that unfortunately could be mistaken for a hockey puck.